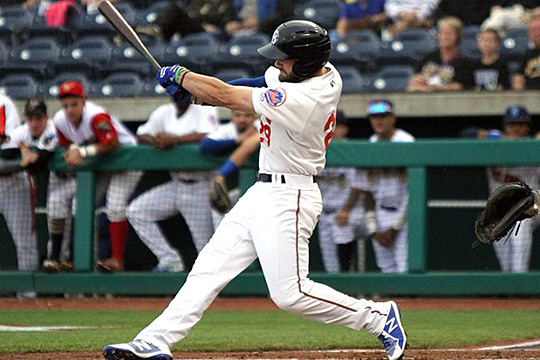 Former Toledo baseball player Ross Adolph was named the 2018 Sterling Award winner for the New York Mets’ Single-A affiliate Brooklyn Cyclones. The team hands out a Sterling Award to each of its nine minor league affiliates that is intended to honor each team’s most valuable player. Adolph’s first professional season was a roaring success. The Findlay, Ohio, native was a New York Penn League All-Star and was named the game’s MVP after hitting a triple and a home run. He hit .276 for the Cyclones, driving in 35 runs and collecting 28 extra-base hits, including seven home runs. He ranked third in the New York-Penn League in on-base plus slugging (.857), slugging (.509), and runs scored (47), and he also stole 14 bases. Adolph was selected by the Mets in the 12th round of the Major League Baseball Rule 4 Draft in June, becoming the 46th UT player in program history to be drafted. An All-American and all-region performer this past season, he turned in one of the best seasons by a Rocket hitter ever in 2018. The first-team All-Mid-American Conference and All-MAC Defensive Team selection tied the program’s single-season home run record with 15, tied for most in the league. He also led the MAC in RBIs (56) and was tops on the squad with 50 runs scored, 69 hits, 12 stolen bases, a .654 slugging percentage and a .445 on-base percentage. He became the first Rocket with double-digit home runs since 2010. This entry was posted on Friday, October 5th, 2018 at 3:50 am and is filed under Athletics, News .